Speed freaks will enjoy the neck's slim-profile come-hithers, and everyone, its tone. Thick, luxurious humbucker tones. Neck will suit speedy players. Coil-tapped tonal options. Lots of fun. We'd prefer a thicker neck. As the big daddy of Farida's CT series, the CT-36 is priced accordingly. But it's the sort of imaginatively spec'd instrument that presently makes Farida such an attractive option for those on a budget who are looking for a something a little bit special. "The CT-36 has a couple of surprises in two coil-taps on its treble pots - which make the guitar a little more than just a classic rocker"
With two vintage-voiced Alnico humbuckers seated in a solid slab of contoured mahogany, at first blush the CT-36 specialises in a tone that'd harden the arteries: cream and beef; warm, rounded and hearty. There's a thick, luxurious quality to the CT-36 when operating out of either the bridge or neck humbucker. It has a slim, satin-finished maple neck that's bolted onto the body. It's good fun to play, and has a tone that's incredible at this price. But the CT-36 has a couple of surprises in two coil-taps on its treble pots - which make the guitar a little more than just a classic rocker. When activated, they open up a whole new world of tone, from glassy, authoritative cleans, to elastic single-coil tones that are just the bee's knees for chicken pickin' and rockabilly. Again, this option speaks to the attraction of Farida as a brand; offering this up at this price is a compelling reason to decommission brand and national snobbery. Of course, it's not perfect. 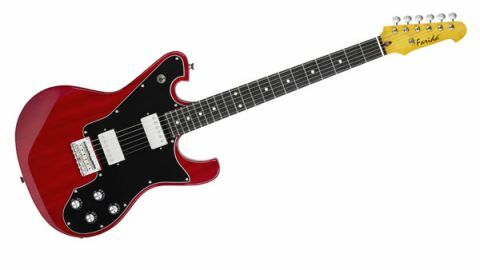 It might play a bit more comfortably with a thicker neck, but speed freaks will enjoy the neck's slim-profile come-hithers, and everyone, its tone.